The multiple Grand Slam winner has been conferred the Arjuna Award, Padma Shri, Rajiv Gandhi Khel Ratna and Padma Bhushan — the recognitions are a result of her several wins. 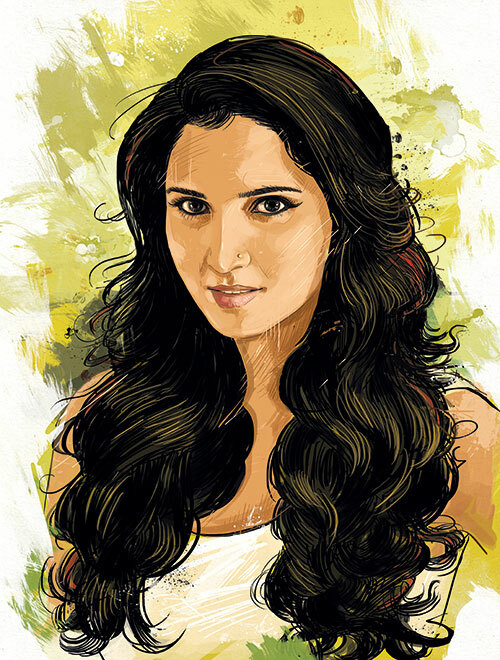 Over the years, she has been at the centre of many controversies, but the feisty Sania Mirza has always taken every brickbat in her stride — on the court and off it too. Looking back, what really shaped your success? Since I was 12, I knew I wanted to play tennis seriously and not merely as a casual game. I had realised by then that working hard every day is the only way to excel. Your advice for aspiring tennis players would be…. Focus on your goals and believe in yourself, no matter what. I’ve always done what I have believed in and loved, and not let detractors hold me back. I hope that that kind of attitude, grit and determination has been seen in my play. I wish many more girls would break out of their shells so that we will have more athletes coming out of the country. Were there times when you felt like giving up? On the court, I have had many tough matches. Off it too, I have faced many obstacles, but I’ve never had an “I quit” moment because I believe in succeeding against all odds. And that is my biggest challenge and achievement. I remind myself of that every time I feel a little down. But, the pressure to perform is always there, especially when you are in the top spot. You are the most hunted player. But, I love the pressure and would rather be in this hot seat than not. What drives you after so many years of playing? My love for the sport has defined my life. Today, it would be very easy for me to stop. I have achieved everything that I possibly could have…but my passion for the game keeps me going. To always believe in myself even though all the odds seem to be stacked heavily against you. As soon as I am off the court, I switch off. I then concentrate on spending time with my family and loved ones. How has life in the public eye affected you? There is a lot of scrutiny and pressure when you are in the limelight. To grow up famous is difficult, because as teenagers you tend to make mistakes which get written about, judged and criticised. My journey has had its challenges, but my family stood by me and I kept myself very grounded — that has been my biggest strength. If there is one thing you could do differently in your journey, what would it be? Absolutely nothing! It has made me the person I am today. My tennis academy — I want the younger generations to have access to the sport and enjoy it as much as I do. How do you feel Brand Sania has impacted others? Trying not to let critics pull me down, I have had the courage and confidence to face life on my own terms. I hope that this attitude inspires other girls to live with a degree of self-respect. And I hope that my career graph influences many young girls to take up sports or encourages them to follow a dream that is unusual.